XENA INDUSTRIAL CORPORATION is professional manufacturer for patented Hawk Pipe Wrench. With one decade research and testing, we set up this factory to make production. 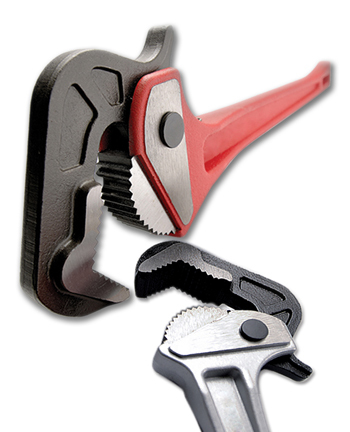 Hawk Pipe Wrench has the most accurate grip angle to grip round shape objects by its strong CR-V jaw set. With precision mechanical process, Hawk Pipe Wrench is the most powerful and endurable tool for all piping jobs. It can save at least 50 times working time than traditional Pipe Wrench or other similar tools, whether working on the roof or underground. It’s perfect product to the DIY and PROFESSIONAL Hand Tools market, also hot sales item to the Aftermarket of the Automobile. EU, USA, Taiwan, 20 years Patent to HAWK PIPE WRENCH make us could offer all of the buyers secure and strong right to drive away illegally copy products from the market. 100% Made in Taiwan HAWK PIPE WRENCH with CR-V jaws with cast iron handles 8”, 10”, 12”, 14”, 18” and Aluminum Alloyed Steel handles 8”, 10”, 12”, 14”, 18” are available now, also the professional plumbing tools sets. We exprect to read your inquiry to offer you our best service and supply you wonderful Hawk Pipe Wrenches in near future.